Orange County hosted several family oriented events during Hispanic Heritage Month, held annually from Sept. 15 to Oct .15, to honor the accomplishments of Latinos throughout the United States. 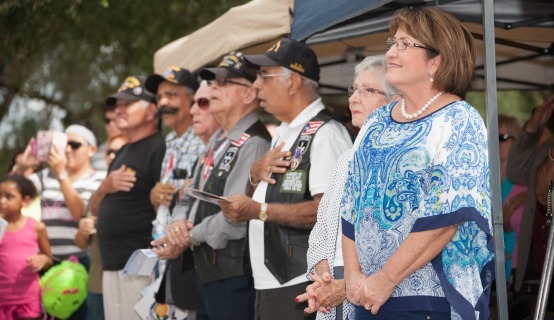 Events ranged from honoring veterans of Puerto Rican descent to a lively parade that was organized by local citizens and attended by residents from across Central Florida. The Hispanic Heritage Committee of Greater Orange County (HHCGOC) coordinated and organized a festive kick-off reception on the north lawn of Orange County Government’s Administration Center in mid-September that featured musical performances, delicious food and an exhibition highlighting the works of talented local Hispanic artists. The event was attended by Orange County commissioners, constitutional officers, employees and more than 150 citizens. Orange County Mayor Teresa Jacobs was the keynote speaker at the event and acknowledged the many accomplishments of Hispanics in Orange County during her remarks. In late September, the HHCGOC’s Orange Fiesta in the Park continued the region’s celebration of Hispanic arts and culture and also recognized the accomplishments of the U.S. Army’s 65th Infantry Regiment, also known as the “Borinqueneers,” a unit that was comprised of Hispanic, primarily Puerto Rican, soldiers. Mayor Jacobs honored the veterans with a proclamation that named September 27, 2014 as 65th Infantry Regiment Borinqueneers Day. “We in Orange County want to honor, commend and remember the Borinqueneers who served in the 65th Infantry Regiment for their patriotism and bravery, reflecting on the sacrifices of these individuals who fought nobly to preserve our nation’s freedoms,” Mayor Jacobs said at the event. The 65th Infantry Regiment traces its creation to the first infantry battalion of Puerto Rican volunteer troops authorized by Congress in 1899, having served actively throughout the globe during World War I and II and the Korean War. The Borinqueneers were among the first infantry troops to engage the enemy in Korea, courageously defending key positions throughout the battlefront. During their service in Korea, they earned numerous awards, even while facing segregation and discrimination. On June 10, President Barack Obama signed into law a bill awarding them the Congressional Gold Medal. The United States House of Representatives lists the 162 distinguished Congressional Gold Medal recipients who include former President Ulysses S. Grant, author Robert Frost, actor John Wayne and civil rights activist Rosa Parks. Roberto Acevedo, Special Assistant to Mayor Jacobs and vice president of the Hispanic Heritage Committee, assisted in planning and coordinating the Downey Park event. During the event, awards were given to the winners of the Hispanic Heritage Poster Contest while children played on the inflatable bounce houses and kept cool at Downey Park’s splash pad. Carmen Acevedo, a longtime member of the Hispanic Heritage Committee and deputy for the Orange County Sheriff’s Office, coordinates the Hispanic Heritage Poster Contest that Orange County students participate in annually. Orange County also celebrated Latino culture during the Florida Hispanic Parade & Festival that proceeded along East Robinson Street in the Milk District in late September. Mayor Jacobs made a special appearance and participated in the parade that celebrated Orange County’s vibrant Hispanic culture. Orange County Public Schools’ Deputy Superintendent Jesus Jara led the parade as the Grand Marshal. He was proud to see the Hispanic community united at one event. Last week, Mayor Jacobs also hosted a coffee meet and greet with the Hispanic Chamber of Commerce of Metro Orlando (HCCMO), the largest business-related organization representing the Hispanic community in Central Florida. Orange County is a longtime supporter of HCCMO’s mission, which is to provide leadership and to support the economic development of Hispanic businesses and entrepreneurs in Central Florida. A collection of photos from Hispanic Heritage Month in Orange County are available on Flickr for use by the media.